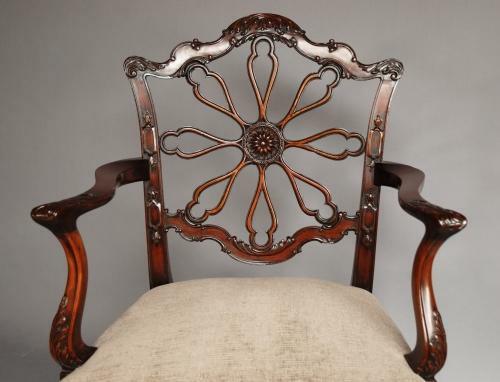 This chair consists of a pierced back with radiating wheel splats with carved central paterae, the top, side and lower back rails all profusely carved with acanthus decoration. The arms and supports are swept and scroll in shape, again with acanthus carving leading down to a stuffed over seat finished in a mink colour fabric in very good condition - the seat could easily be re-upholstered once purchased. The two front legs are square with carved decoration and the back legs are of a plain square swept design, joined with an H-stretcher. This armchair is in excellent condition for age, is of stable construction and can go straight into a home.